Recently, I've often seen this image claiming that some people are dying elephant tusks to prevent individuals from hunting them. Has this actually been done? Is it common? Initially, this seemed a fair idea. However, implementing a staining program seems extremely complicated and, probably, prohibitively expensive. 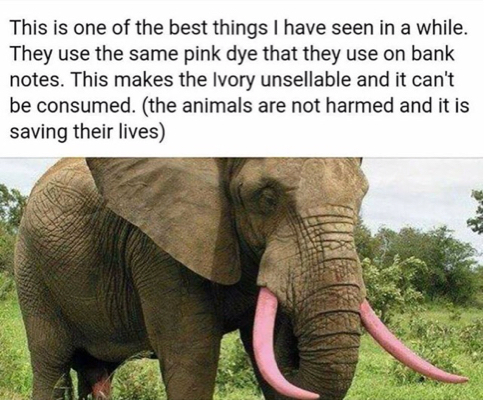 First of all, the dye should be absolutely unharmful for the elephant and the environment around him; researchers do not know how a different color of the tusks could affect the elephant's life. The dye should be capable of staining the whole length of the elephant's tusk, which protrudes into the skull. 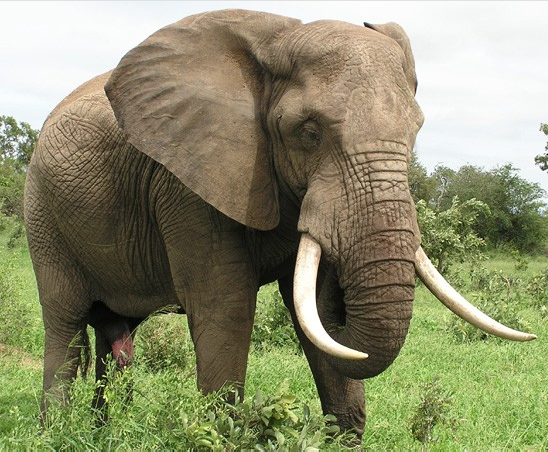 And of course, tusks grow too; dye should obviously be reapplied as soon as new growth reappears: even a small quantity of ivory holds great value to a poacher. Moreover, a delivery method not requiring anestethics should be found: they are expensive and tranquilizing an animal involves risk to the people and the animal. I cannot speak to the viability of dying tusks, but it does appear that the photo cited in the question is a fake, as noted on the blog staintuskstostopelephantpoaching.wordpress.com. Thanks for your note. It’s an interesting idea. The big concern is the time it will take to stain the tusks of 400,000 skittish elephants and the time it will take for the stain to find it’s [sic] way into the tusk. Most likely, permanent stain will have to be delivered by food and grow into the tusk. You can’t immobilize 400,000 elephants to stain their tusks as it is too risky for the elephants and the people doing the immobilizations. Thus, it would take many years to achieve your goals, if it is even possible. Given the urgency of the situation (30,000-45,000 elephants now being killed annually), we need a plan that stops as much of the killing as possible, as soon as possible. (This is, of course, in addition to programs aimed at decreasing demand.) Our program aims to achieve these objectives by using DNA assignment to identify all major poaching hotspots across Africa for targeted law enforcement. The same blog goes on to discuss different problems developing and administering an effective dye. I could find no source to suggest this was actually being done anywhere in the wild. There is at least one organisation that dyes Rhino Tusks pink, although there are also plenty of doctored photographs of that too. The Rhino Rescue Project has a dye which, while harmless to the rhino, gives a very bad reaction to humans, including nausea and vomiting. The dye renders the horn useless for "medicine" and ornamental use because of this, but needs reapplying every few years. Here are some actual pictures of this happening to a rhino. 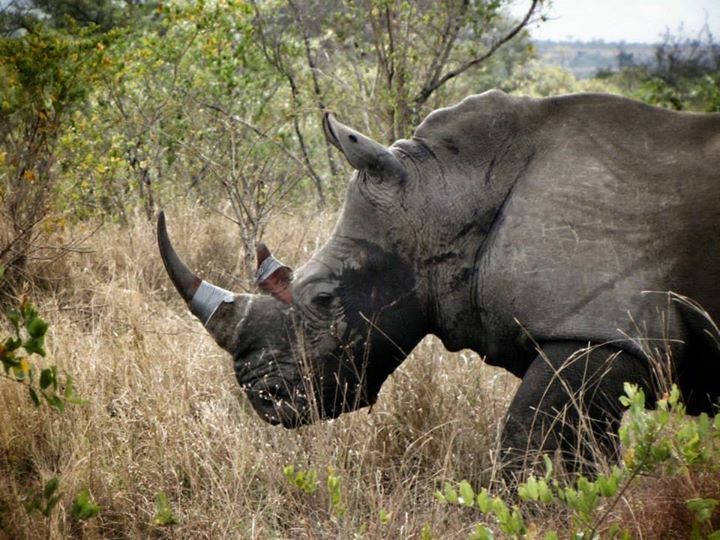 It's worth noting that rhino horns are made of a different substance to elephant tusks, so it's still unsure whether a similar undertaking would be appropriate for elephants. Does animal experimentation delay results in medical research?